My favorite childhood macaroni and cheese came straight from the freezer section; manufactured by the now defunct Morton Frozen Foods. Mom, always kind of a health nut, never purchased junky "kid food." No Skippy peanut butter for us. Our flavorless spread came from the do-it-yourself peanut grinder at the health food store. Froot Loops? In my dreams. Coca Cola? Only when we visited Dad. (Insert violins.) Yet for some reason, frozen entrées got an occasional pass. This junk food deprivation may have attributed to my revisionist memory of Morton's Mac and Cheese being one of the greatest things I ever ate. Packaged in a mini aluminum pie pan, it was the perfect kid's sized portion. I always requested extra cook time to achieve a crispy brown top, natch. Hey, at least I'm consistent. A few weeks ago, I received an email from a friend looking for a recommendation for the "best" frozen mac and cheese. Truth be told, I do not make a habit of purchasing frozen mac -- or meals for that matter -- however, my curiosity got the better of me. Searching the freezer section at Von's, I confirmed my suspicions that Morton's had gone the way of my other childhood faves like the "Reggie" (Reggie Jackson) Candy Bar. Round in shape (inspired by a baseball, perhaps?) 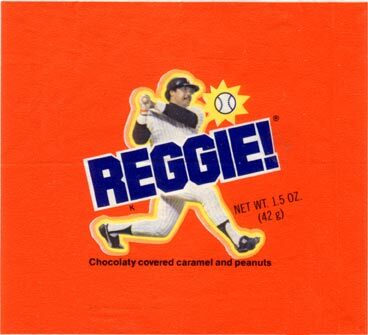 it had a rich caramel center, peanuts and a milk chocolate coating, kind of like a Snickers bar if you sat on it and took out the nougat. Yum! And The Marathon Bar with its braided caramel covered in chocolate, "It's so satisfying." Yes, people, I am that old. But back to the business at hand, frozen macaroni and cheese. The results are in and all I can say is, if you have time, make macaroni and cheese from scratch and freeze the extras. It'll be way better than anything pre-made with the exception of Beecher's. And now, part 1 of a 2 part review. Trader Joe's Mac'n Cheese vs. Amy's Macaroni and Cheese made with Organic Pasta. When I opened the box, I found the plain noodles segregated from the cheese sauce in layers; noodles on the bottom, cheese sauce scooped unevenly on top. I think all ingredients should be pre-mixed together in the spirit of harmony but perhaps this method contributes to the cooking chemistry. The requested cook time of 20-25 minutes was not enough time. I ended up cooking it for 45 minutes to get it good and hot and achieve a crispy top. After 25 minutes, I stirred the separated noodles and cheese together and put it back in the oven for another 20 minutes. The Verdict: This one tasted the most like my cobwebby childhood memory of Morton's. 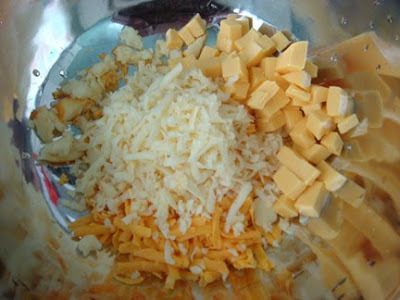 The cheddar gave it a nice tang and the use of Gouda, Swiss and Havarti made this preparation the most "gourmet" of the bunch. It was a little greasy due to the cheddar but overall, I'd recommend this version in a pinch. Suzy G thought it had good stretchiness and decent flavor, but she agrees that you have to bake it for twice as long as the box suggests. 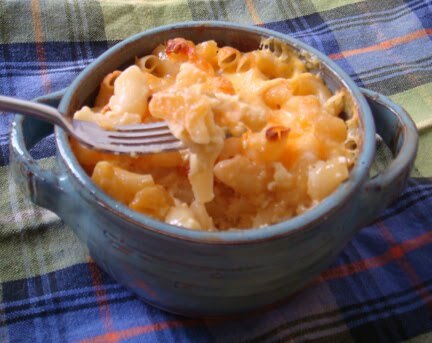 Amy's Macaroni and Cheese made with Organic Pasta. Seduced by the mere mention of "organic pasta," I had high hopes for Amy's brand mac and cheese. But alas, it didn't live up to the glamour of its high falutin' ingredients. After the 35 minutes suggested bake time, the cheese top had a slightly brown crisp and appeared cooked all the way through. Thumbs up for correct cook times! Things still seemed promising until I took a bite. The noodle texture can only be described as overcooked and gummy, like gummy bear-gummy. Perhaps TJ's separates the noodles and cheese to keep the noodles firm. Amy's sauce, albeit trés creamy, tasted salty and lacked any recognizable cheddar cheese flavor. 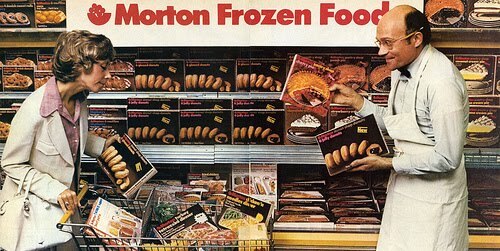 It didn't taste processed, though, a real feat for frozen fare. Overall, this version reminded me of stove top mac rather than baked. I can't recommend it but it wasn't sucky. A speaking of sucky, stayed tuned for Michelina vs. Stouffers.